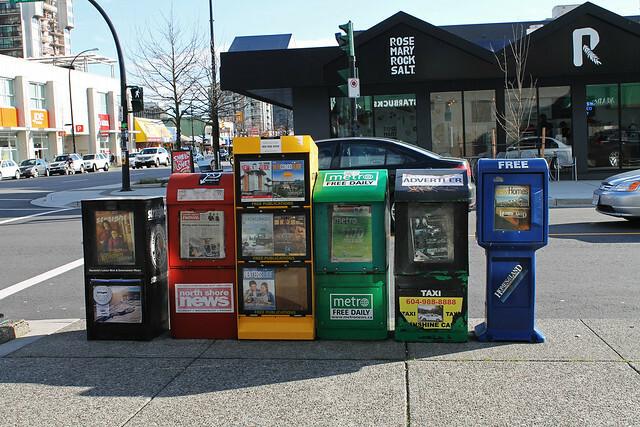 With most of the newspapers going online, there is no more a great need for paper copy of one. But some people still like it better the old way. They are free (most of them), earning money from ads and fighting bigger and more famous competition the only way left to them. LOL … Good weather. Your post cheers me up. Rose Mary Rock Salt ????????????????? I love the new free paper funded by advertising way of doing things. I’ve seen loads of publications turn themselves around like that, going from about to close down to profitable again. Some of them are more profitable than they’ve ever been under that business model. Yes, for most of them it is a way pf survival in the market. A lot of people – me among them – got all the news they need through Internet and paper is slowly going to history. However, it is still easier to read something printed on paper than looking at monitor for whole day. What’s cool is that you can see the reflection of “Starbucks” (backwards, of course) in the window.